I am a firm believer in the healing power, especially the emotional healing power, of pets and animals for those with chronic illnesses. The unconditional love of a shelter pet is an amazing gift. 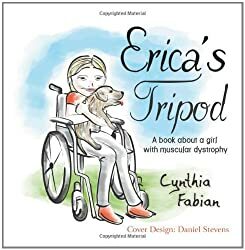 When I was asked to read and review Erica’s Tripod, by Cynthia Fabian, with my daughters, I was excited to read about the girl and her new dog. Being fairly familiar with muscular dystrophy, the girls and I looked forward to reading this book. What did we think of Erica’s Tripod? Quick Summary of Erica’s Tripod: A book about a girl with muscular dystrophy. Erica is a young girl with MD who struggles with day-to-day problems, but is learning how to manage with the help of Tripod, her new dog. Erica’s mom has brought home many pets over the years that needed homes, but this time, the dog has challenges of its own. Can Erica make friends with the new addition to the family, and manage her disease at the same time? Learn what it’s like living with MD in this uplifting novel. I received a complimentary copy of this book for use in my review. I was not compensated for this review and all opinions are my own. I may; however, receive slight compensation from affiliate linking within my posts. We were taken aback by the main character’s anger. While the story did have an uplifting ending, the main character was extremely (and painfully) anger and bitter about her condition. She was very mean, pain filled, and difficult for my daughters (or me) to like. While, as an adult, I can understand Erica’s anger—it just seemed extremely harsh for a children’s book. Certainly, I am not suggesting that MD is a happy, joy-filled, illness by any means—I just felt that the character in this story needed much more than a companion animal for counseling and that reality was a bit too harsh for most families unfamiliar with such medical conditions. We loved Tripod the dog. The little dog held the resilience and the resolve to cope with his disabilities—and the heart to help Erica cope with hers. Unconditionally. Tripod redeemed the book for us. While Erica was mean and bitter—we were able to make some positive (hopeful) predictions about Tripod’s future impact on Erica’s overall health and outlook. Would we recommend Erica’s Tripod? The main character is so very angry and pain filled—and struggling to cope with her muscular dystrophy. I found it a stark look into the heart and mind of a young MD patient—and it may be too harsh for some children. My girls are older and we were able to talk about the illness, its effects on the body, and the emotional toll that it takes on its patients--especially children. We were also able to discuss the needs of less than perfect/healthy shelter animals. I am not sure that I would call it an uplifting book—but, rather, eye-opening. I think it shows the value of living life as it is without regrets or wishes for “what could have been” in a perfect world. I think those touched by muscular dystrophy or another chronic illness may gain from this book—but, I am not sure that it’s right for all children—especially without family discussion.